Supplying cash and managing self-service devices can be complicated, time consuming and expensive for financial institutions. With growing reliance on self-service devices, it's critical to support 24/7 device access and availability. 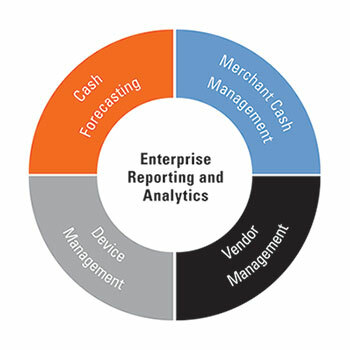 Cash & Logistics solutions from Fiserv help you meet customer demands while simplifying cash management processes, reducing costs and improving availability of devices. Help reduce costs with lower operational, transportation and holding expenses, increase staff productivity, improve vendor management and cash supply chain automation. Assist in decreasing risk and improving your ability to comply with adherence to standardized policies, central control, and visibility using advanced technology platform and analytics. Provide state-of-the-art customer service by optimizing currency levels for higher availability across the enterprise.